A set that really lives up to the promise of its title – as it presents a dozen tracks that forever laid the foundation for house music in Chicago – and a globe's worth of dance music to come! 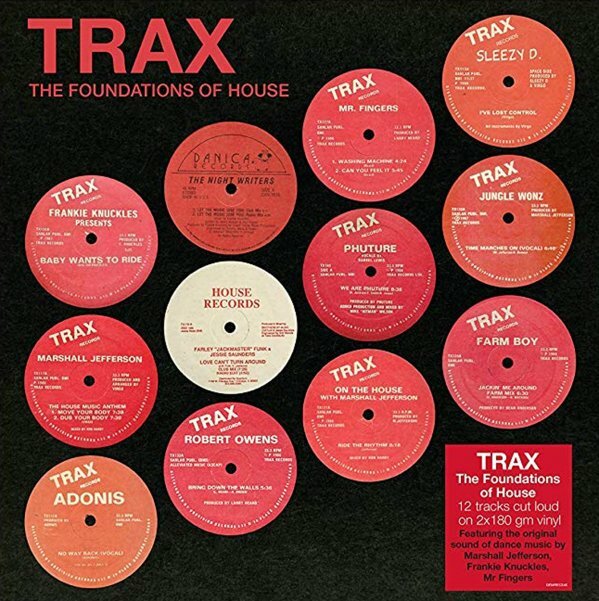 The package presents a dozen of the most important singles from the legendary Trax Records – the Windy City hotbed of house, responsible for giving an important showcase to all the underground DJs and producers making music at the time. You'll instantly recognize a few of these classics, and together the set's as proud of a Chicago statement as we could ever hope to make – with titles that include "Can You Feel It" by Mr Fingers, "We Are Phuture" by Phuture, "Let The Music Take You" by Nightwriters, "Baby Wants To Ride" by Frankie Knuckles, "No Way Back" by Adonis, "Move Your Body" by Marshall Jefferson, "Bring Down The Walls" by Robert Owens, "Love Can't Turn Around" by Farley Jackmaster Funk & Jesse Saunders with Darryl Pandy, "On The House" by Marshall Jefferson with Ride The Rhythm, "I've Lost Control" by Sleezy D, "Time Marches On" by Jungle Wonz, and "Jackin Me Around" by Farm Boy. © 1996-2019, Dusty Groove, Inc.